In the United States, July 4th is the number one day for lost pets. 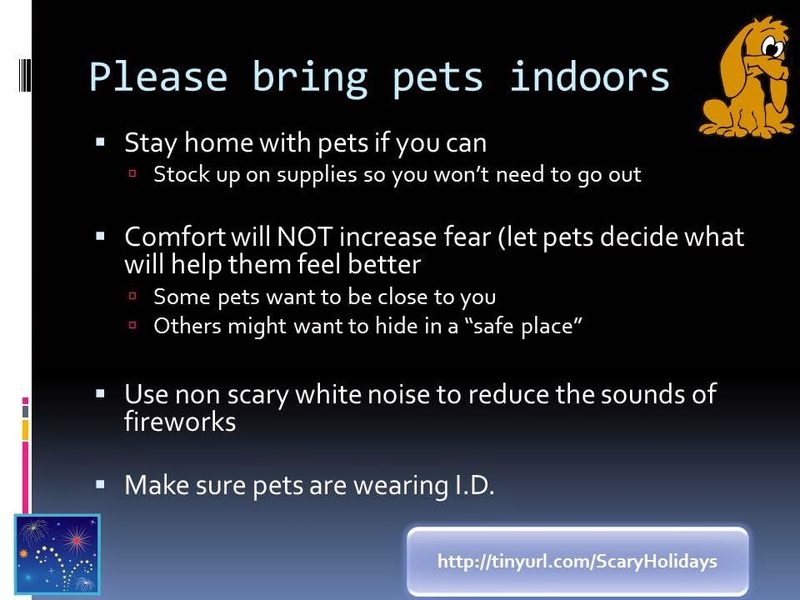 Please keep pets indoors during scary fireworks. If pets must be outdoors, make sure the fencing is secure and and place current I.D. on your pets. Comforting a scared pet will not increase his/her fears. Of course comfort is in the eye of the beholder. Some dogs do not want petting. They just want to hide. We should honor that. Some dogs want to be close to us. We should honor that. If we are going to comfort our dogs, we need to be calm ourselves. If we are scared and speaking frantically or rubbing frantically, we might make our dogs feel worse. “Fear is an emotional state-a reaction to the presence or anticipation of something highly aversive. It is not an attempt at manipulation"
[Animals] don’t pretend. If they don’t feel afraid, they don’t act afraid. When their emotional state changes, so do their behaviors.